This issue demonstrates why Storm is a hero I actually fantasize about being. Of all the other comics I read or the other superheroes I think are great, Storm is the only one I’d be if you gave me half a chance. (That maybe because the rain has finally come to California and if I could control the weather my commute would improve 10-fold, but that’s not the point.) I love how she never breaks character – she’s never less than a queen but she’s always human, torn between what others want from her power and what she thinks is right. From the jump, let me say I currently hate Yukio with a deep passion. Her brand of pragmatism just makes me want to slap a person. Further, in the first few pages, she reminds us all why she’s got the reputation she has by putting a little blackmail on Storm to get her to play by her rules. This issue is very much about rules, who sets them and who breaks them. And as we know, Storm is too much the queen to let herself get played by someone else’s rules. Yukio gives Storm the “fine then” treatment. Storm’s mourning for Wolverine continues, with a sensitive sadness that keeps the opening of the comic subdued. Even once the action picks up, the drive to respect Wolverine’s memory permeates all of her actions as she tries to find her way through the outward appearances of Wolverine’s behavior to his intent – the plan he wouldn’t have shared with Yukio or anyone else. She knows it is there, she just has to find it or invent her own. 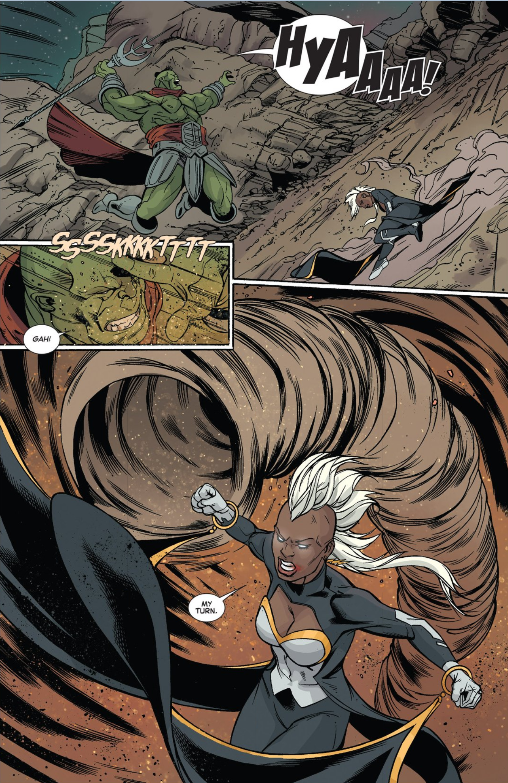 Storm’s combat scenes in this comic are the perfect complement to her dialog. Her mutant powers are supremely powerful and she uses them prudently, in exact lightning strikes and overwhelming wind attacks. This matches exactly her commanding tone and short, biting comments. She is in complete control of one of the most powerful mutant abilities around and she’s not afraid to flex that power when necessary. Her brand of pragmatism gives less leeway to evil and enriches no one at someone else’s expense. When it all goes to hell, and you know it is all going to hell, Ororo’s response is one of disappointment in herself and in Yukio, but never in the cause. She never stops working towards a better solution, even when her “friends” sabotage that. These are the things that make Storm such an icon. She’s got the kind of power that makes you stand on a porch in the rain and fantasize about controlling the storm (what? You don’t do that?) and the kind of restraint that you wish that you had, but probably don’t. Even in defeat, she limps away with her conviction intact. Such a hero. On Wednesday the 19th, Brett White wrote an impassioned plea for the Storm comic. His point, which isn’t incorrect, is that Marvel just cancelled Elektra and She-Hulk – and that Storm’s sales numbers are smack in the middle of the numbers for those two comics. Connecting the dots, he predicts that the February issue may be Storm’s last. His rallying cry, and some quick Twitter action, has given life to the #SaveStorm hashtag. If you love Storm like I do, tweet your support there and to @Marvel. And buy the comic. It is worth your bucks.